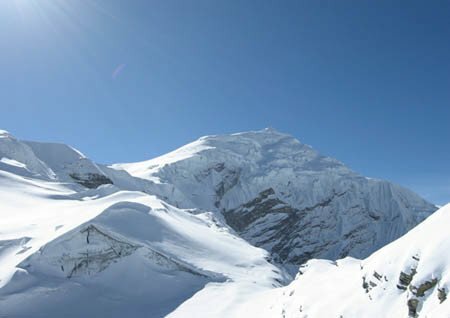 Chulu West Peak is situated in the Annapurna and stands out as a great climbing destination for mountaineers and adventure seekers alike. 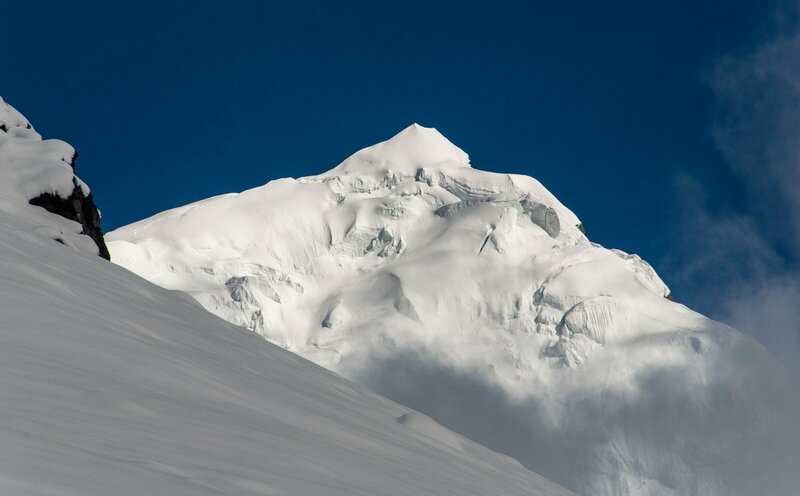 Flaunting its snow-laden peak, it rises magnificently to mesmerize everyone raring to undertake the climb. 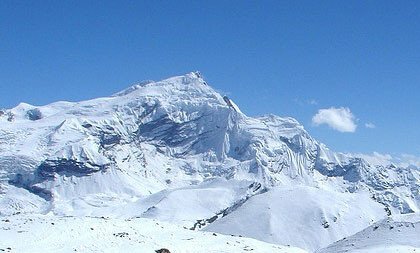 While also serving as an excellent vantage point to behold the views of the Annapurna ranges, the cultural diversity and biodiversity throughout the duration of the journey are certain to fascinate you. We will start our journey to Chulu West Peak climbing through a scenic drive to Jagat via Besisahar. On our way, we will be enjoying the mesmerizing views of the Annapurna massif. We will also pass through the dense forest areas of pine, fir, oak trees admiring the natural vegetation of this region. We may need to use different trekking gears to climb up the mountain under the guidance of the experienced trekking guide. Also, one must be in good physical condition as the climb goes through some challenging steeps. Marveling upon the view atop the Chulu West peak, we head to Muktinath after passing Thorung-La pass (5416m). Following a visit to the revered pilgrimage site, we head to Jomsom to take a flight to Pokhara marking the end to a marvelous journey. The overall journey awes us with the magnificent views of lush green valleys, verdant and dense forests and the stunning mountain views of Dhaulagiri (8167m), Nilgiri (6441), Annapurna (8091m), and other Himalaya peaks. Meandering through a diverse topography throughout the trip, we can’t help but be amazed by such diversity in natural wealth and cultural heritage. Swiss Family Treks and Expedition has been one of the best agencies in the travel and tourism in Nepal for more than a decade. We have the best-experienced team in tourism serving our clients with all the requirements they need. We provide excellent transportation and accommodation services along with English-speaking guides to assist you throughout the journey. On your arrival at Tribhuvan International airport, one of our staff representatives will pick you up and greet you. They will drop you at the Hotel in Kathmandu. Overnight at a 3-star hotel in Kathmandu. Day 02: Full day Sightseeing Trip in Kathmandu Valley, Overnight in a 3-star Hotel. Today, we will spend our whole day sightseeing around Kathmandu valley with our experienced English speaking tour guide in a private car. We will visit around the world heritage sites in the city like the famous sacred Hindu temple- the Pashupatinath temple, the Monkey temple- the Swayambhunath stupa and the largest stupa in the World- Boudhanath Stupa. In the evening, we will return back to our hotel. Overnight at a 3-star hotel in Kathmandu. After having our breakfast, we will leave for Jagat which is situated to the west of Kathmandu. Enjoying the eye-catching views of the Himalayas, we reach Besisahar. We will stop by the Besisahar for lunch. From Besisahar, we will continue on a rough and dusty road along the Balham River. We will cross many rivers and drive along the Marsayangdi River to reach Jagat. Overnight at a Lodge in Jagat. Today the trail will be descending along the Marsayangdi River and continues along the thick forests of pine and oak. We will walk along few settlement areas like Sattale, Tal and Karte to reach Dharapani. Enjoying the mesmerizing views of the Annapurna range and the scenes of the beautiful green valleys all along the way, we will reach our destination. Overnight at a Lodge. Initially, the trail climbs up to Bagarchhap. 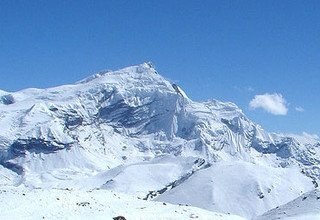 The beautiful Himalayas like Lamjung Himal (6983m) and Annapurna II (7937m) comes into our site. From here, the trail mostly ascends along the mule track through the dense forest of fir, pine, and oak and continues along the river bank to Chame. Chame is a small settlement area and also the headquarters of Manang District. Stay overnight at a Lodge. Enjoying the beautiful sunrise view over the Lamjung Himal (6983m) we will head towards the Pisang situated at the height of 3200m. The trail mostly passes through river valleys and crosses Marsayangdi River twice. Crossing the Bhratang village, the trail mostly passes through the dense rhododendron and pine forests to Pisang. We will see large Mani walls and prayer flags hanging, before reaching Pisang. The beautiful view of the mountains like Pisang Peak (6091m) and the Annapurna II (7937m) can be seen. Overnight at a Lodge. The trail further continues through the Lower Pisang to the beautiful Manang village. We will walk straight to the Ghyaru village along the bank of the Marsayangdi River. The trail mostly passes through the thick coniferous forests which to open out to a wide field of Manang village. We can see the amazing views of Annapurna II (7937m) and Annapurna III (7555m) on our way the village. Stay overnight at Lodge. Acclimatization is the best way to avoid altitude sickness so we need to acclimatize to this altitude. 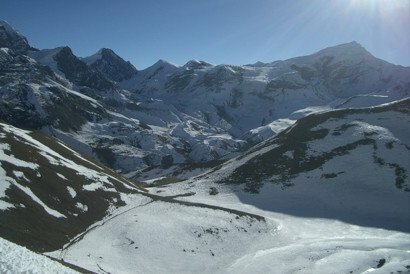 We can explore Manang village or we can simply enjoy the beautiful views of the Annapurna vistas and Gangapurna Lake. Manang is heavily influenced by Buddhist faith evident by a great number of monasteries in the region. Stay overnight at a Lodge. Today, we'll start our trek along the north direction through the rural community of Ghunsang and continues along the winding road taking us to Yak Kharka. From here, we'll follow the trail passing through Gyachung Khola. After a few hours of walk, we will reach the small settlement area called Yak Kharka. It is a beautiful spot to observe the amazing views of Annapurna (8091m), Gangapurna (7454m), and Tilicho Peak (7134m). Stay overnight at a lodge. We will cross a suspension bridge and reached Ledar. From Ledar, the trail becomes steeply climbing to The Chulu West Base Camp. It will almost take 5-6 hours to reach there. 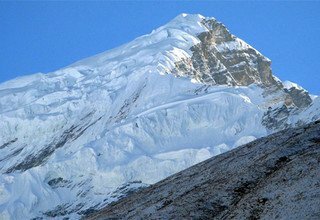 Before reaching the Base Camp, we will follow a trail that ascends on the steep and rough terrain. It is a beautiful spot for enjoying the panoramic views of high mountains. Stay overnight at a tented camp. It will be another day for us to acclimatize and take rest. We will pack all the needed gears and equipment required for the climb. Also, we will be practicing for the climb and learn to use the equipment necessary for the climb. We can also take short hikes around the area to adjust our bodies to the Himalayan climate. Overnight at a tented camp. 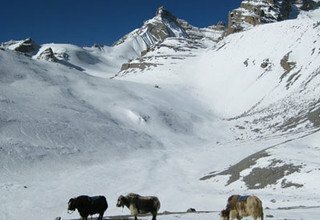 It will be a challenging climb and we trek up to High camp under full guidance. 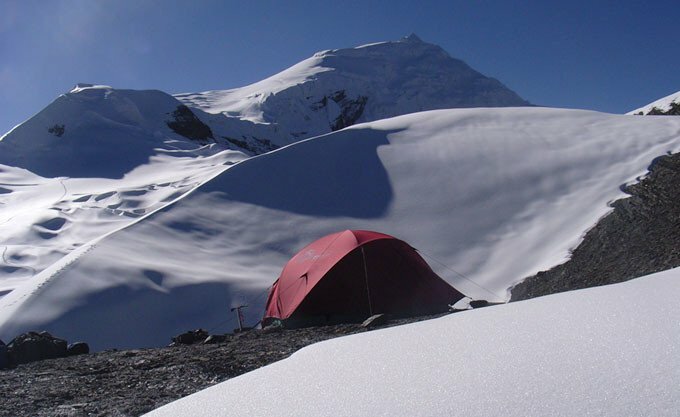 We will climb along the ridgeline and also along the technically demanding ascents to the High camp. On reaching high camp, we will find a proper place to set up our camp. We will rest and sleep early as our climb begins early in the morning. Overnight at a tented camp. Today will be the most fascinating day of the journey as we will climb the Chulu West Peak. We begin the climb early, around 1-2 am, as the winds in the mountains tend to get stronger at mid-day. 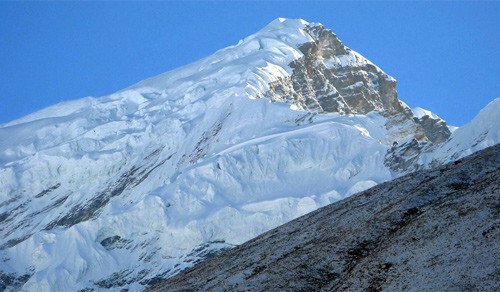 We will walk along the slippery icy ridges using the trekking gears with our climbing guide. As we summit the peak, we will be rewarded with the views of the majestic peaks in the Annapurna range. 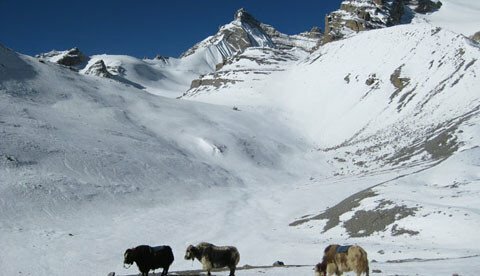 After enjoying some time we will descend back to Base Camp and then overnight at Base Camp. Overnight at a tented camp. 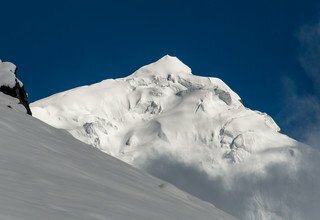 Today is the reserve day allocated for situations when the climb is not possible on the summit day. As mentioned earlier, the weather conditions can get severe within a matter of moments in these areas. So, we will scale the peak on this day if we fail to complete the climb on the scheduled day. Overnight at a tented camp. The trek today begins as we head along the Kone Khola which runs all the way up to our destination for the day, Thorung-La Phedi. We will follow the descending trail along the Kone River to the wooden suspension bridge. From here the trail ascends through the narrow rough hills to Thorung-la Phedi. Stay overnight at lodge. Today we will descend along the trail following the Thorung Khola and traverse along the river bank up to the Thorung-La Pass (5416m). 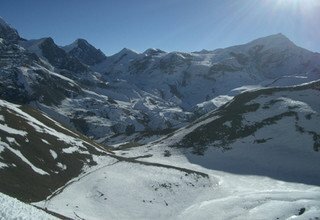 This pass is also World’s largest pass and offers stunning views of the Annapurna and Chulu massifs. From there, we will trek above the forests and farmlands for about five hours to reach Muktinath. Muktinath is a revered religious site for Buddhists and Hindus. A famous sacred Temple of Lord Vishnu is situated here with 108 stone taps. Stay overnight at the Lodge. We will descend to Jharkot which is a famous Thakali village. It has a diverse Tibetan culture with Thakali as the primary inhabitants. From Jharkot, we will descend to Kagbeni and then to Ekle Bhatti. We will traverse along the dense forests of pine and fir to reach Jomsom. Jomsom is famous for strong mid-day winds and has plenty of modern luxuries such as internet and restaurants. Overnight at Jomsom. Day 18: Fly from Jomsom to Pokhara 820m/40minutes and transfer to Hotel. On this day we will fly back to Pokhara and then we will transfer you to the hotel in Pokhara. The flight offers scenic treats throughout and the diverse landscapes and towering peaks are a relief to sore eyes. The flights can get delayed or canceled if adverse weather conditions arise. We have alternative plans if such conditions do arise. Upon reaching Pokhara, we can enjoy the beautiful city and its attractions. The Lakeside area is especially famous for offering lively nights. Overnight at the hotel. Day 19: Drive from Pokhara to Kathmandu and transfer to Hotel. On this day we will drive back to Kathmandu along the Prithvi Highway. The drive presents beautiful roadside settlements and gorgeous landscapes all the way to Kathmandu. On reaching Kathmandu we will transfer you to the hotel. You can rest and shop for souvenirs to mark the end of the adventurous journey. Stay overnight at a 3-star Hotel in Kathmandu. On this day we will drive you back to Tribhuvan International Airport for your scheduled flight bidding you goodbye. * 4 nights accommodation with breakfast at 3*** hotel in Kathmandu and Standard hotel in Pokhara. * Kathmandu city/sightseeing tour as per the above itinerary and entrance fees. * Lodge to lodge and Tented accommodation on sharing basis during the trek and climbing period. * 1 experienced, helpful and friendly guide, 1 cook and 1 helper, porters (1 porter for 2 peoples), their food & accommodation, salary, equipments & insurance. * Camping Equipments (Tents, Kitchen Utensils and Mattresses). * All transportation by bus/car. * Domestic flight from Jomsom/Pokhara and airport tax. * Peak Climbing permit, Garbage deposit. * Peak Climber’s (Sherpa) equipments charge. * First Aid Medical Kit box and necessary emergency equipments. * Any meals (Lunch and Dinner) in Kathmandu and Pokhara other than breakfast. * Any costs which arise due to a change of the itinerary, because of landslides, domestic flight delays, political disturbance, and strikes etc.